In a recent post I said our late season tomatoes tasted good, even though they looked bad. But that's before I picked a few that weren't quite as delicious as I had hoped. The season may be over now, but I still have a few last tomatoes ripening in a bag. I can almost guarantee that they won't be good to eat without some doctoring. It is especially true for the Japanese oxheart variety, a sort of pink plum tomato that we planted for the first time this year. They just didn't turn out well, even before the frost. 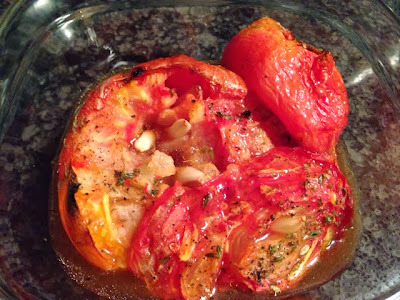 But when they are tossed in the oven for about 30 minutes at 400 degrees, with a splash of olive oil, salt and garlic, the mediocre, mushy tomatoes are transformed into fragrant, flavorful, juicy treats. I've been serving them over pasta with a little grated Parmesan. Mmm. Roasted tomatoes from the garden with garlic, salt and peppers.